An alien race has hit the Earth in an unrelenting assault, unbeatable by any military unit in the world. Major William Cage (Cruise) is an officer who has never seen a day of combat when he is unceremoniously dropped into what amounts to a suicide mission. Killed within minutes, Cage now finds himself inexplicably thrown into a time loop-forcing him to live out the same day of brutal combat over and over, fighting and dying again…and again. But with each battle, Cage becomes able to engage the adversaries with increasing skill, alongside Special Forces warrior Rita Vrataski (Blunt). And, as Cage and Rita take the fight to the aliens, each repeated encounter gets them one step closer to defeating the enemy. Director Doug Liman has a proven track record in original and inventive action. With the Bourne Identity he quietly reinvented the secret agent genre, even forcing James Bond to abandon CGI nonsense in favour of copycat gritty and efficient action. Mr & Mrs Smith continued that trend, delivering an action comedy that had genuine laughs and real punch behind it. Jumper was Liman’s first apparent misstep, as he failed to capture box office attention with what was actually a unique and technically well executed sci-fi concept. Now Liman returns to the genre appropriately hoping to do better this time around. The failure of Jumper can mostly be attributed to lackluster casting, with Hayden Christensen and Rachel Bilson serving as ineffective leads. However, this time Liman has Tom Cruise and Emily Blunt to work with instead. Cruise remains one of the most consistently competent leading men in Hollywood. Whilst deploying many of his trademark mannerisms, Cruise actually explores some novel territory with this character. He plays Cage initially as a meek coward who only gradually and very reluctantly evolves into the more familiar battle hardened superhero. It’s an exponential improvement from watching Cruise effectively tread water in recent efforts like Oblivion or Knight and Day. Emily Blunt also acquits herself very well in her first foray into the action genre. The haughty no nonsense persona that has served her so well in romantic comedies and dramas easily translates into a credible action heroine. She more than holds her own with comfortable ease alongside Cruise. In particular there’s something refreshing and sincerely amusing about watching her ruthlessly train and repeatedly execute Cage, to help him harness the power of his immortality. Edge of Tomorrow also boasts special effects and inventive action concepts that immediately distinguishes it from the countless other ‘alien invasion’ blockbusters. The ‘Mimics’ are truly fearsome and original adversaries even for Tom Cruise armed with a mecha-suit and immortality. Liman also does a brilliant job of handling Cruise’s novel superpower, adequately illustrating the Groundhog Day concept without ever boring audiences with unnecessary repetition. Edge of Tomorrow is perhaps the first big screen summer blockbuster to explore the comparatively high-brow concept of time loops. Though well executed it may still be a little off-putting to those who prefer their action flicks to be less complex and a bit more linear. In truth, it’s actually a remarkably simple plot device that’s explained repeatedly with simple words and dramatic illustrations. It might ironically be those hoping for existential philosophizing and cerebral discussions who are left more disappointed than those looking for the simple pleasures of big explosions. Though the film’s time loop concept is well deployed for dramatic and comedic effect, it does inevitably also mean that much of the film’s action actually consists of an extended training montage and the same battle being endlessly revisited. Cruise’s convenient immortality also means that the film occasionally lacks urgency or a sense of real danger, even during some of the most frantic mecha suit warfare. 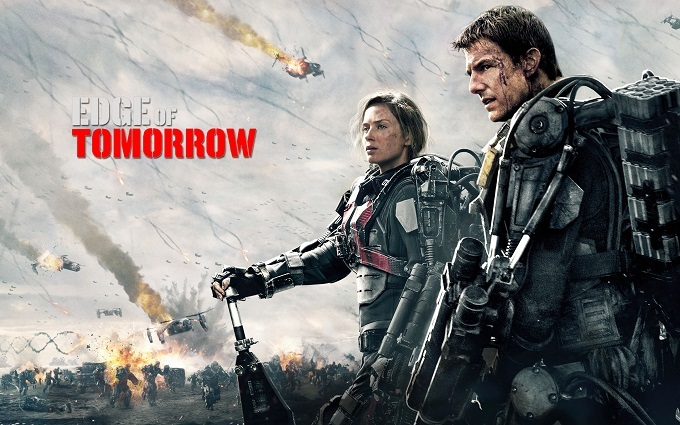 Edge of Tomorrow is a comparatively intelligent science fiction blockbuster that has far more black humour and originality than audiences might expect. It represents a significant return to form for both Tom Cruise and director Doug Liman. It’s worth catching in cinemas, particularly in glorious IMAX format, where the slick 3D effects really do impress most.